Before trying to connect off-campus, be sure to set up your multifactor authentication! You will not be able to connect without setting that up first. You will get an "access denied" error without MFA. You won't be able to connect to your computer's hard drive (C:) or other local drives from your Virtual Desktop. Save to your H drive or cloud storage like OneDrive. You must have the proper permissions (admin rights/access) to install apps on your computer. 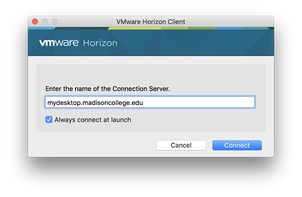 Click on Install VMware Horizon Client. After the VMware... .exe file finishes downloading, click the downloaded file to begin the installation. If you see a User Account Control box for WMware, click Yes. Step through the install - clicking Next, Yes, or Agree as needed. Accept the license agreement. When the splash screen appears, click Customize Installation. When you’re finished, and you sign out / log off and disconnect from the virtual desktop, you will be returned to your computer’s normal desktop. Save to a USB drive, your H: drive or other cloud storage (ex. OneDrive). Don't save anything to the desktop or to local storage (ex.C drive) of the virtual desktop! Everything on the virtual desktop is deleted when you sign out. To disconnect USB Devices, use the USB link in the Toolbar. 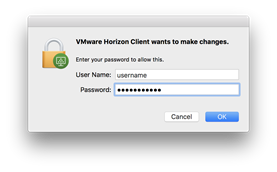 Tip: Drag the VMware Horizon Client to your dock for quick access. 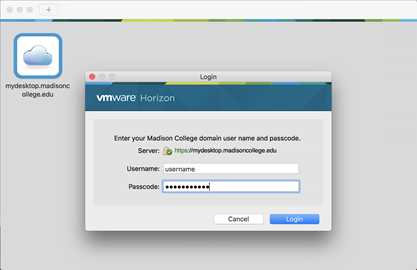 VMware Horizon Client wants to make changes - enter your MAC admin User Name and Password (not your college username and password) and click OK. Note: Virtual desktops run Windows, so USB devices must be formatted for Windows in order to work properly. Mac-formatted USB devices will not work on College virtual desktops. Plug the device into one of the computer’s USB ports. 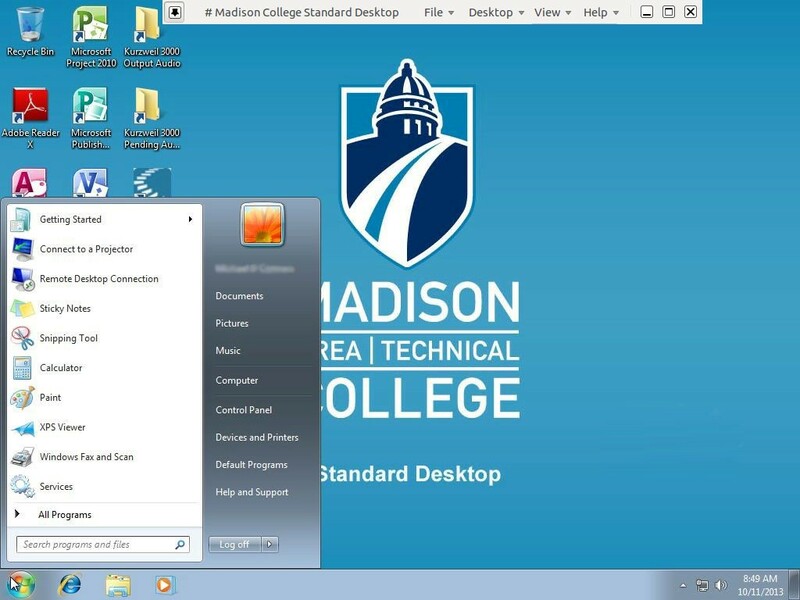 To connect your device to the Virtual Desktop, click on the USB symbol icon in the Toolbar. Click on the name of your device in the menu. It may take a minute or two for Windows to recognize and install the USB Device before it can be used. Disconnect your USB Devices by using the Toolbar. MAC Keyboard layouts and functions - differ between MAC and Windows. 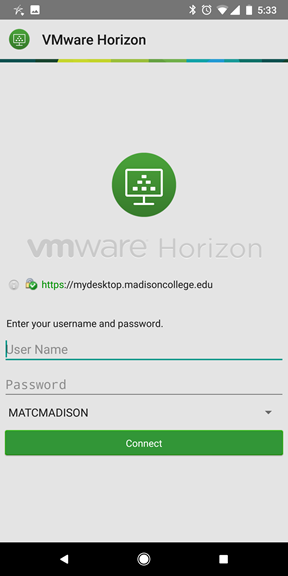 Download and install (or upgrade) the free VMware Horizon Client for Android from the Google Play Store. 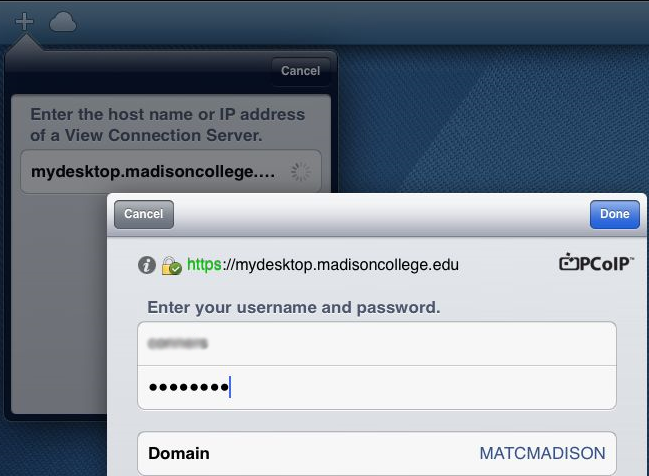 Log in with your usual College username (do not add @madisoncollege.edu) and password, then tap Connect. You should be connected to your virtual desktop. When you’re finished, and you disconnect / log off from the Virtual Desktop, you will be returned to your Android's normal screen. Don't save anything to the desktop or to local storage (ex.C drive) of the virtual desktop! Most desktops are non-persistent, meaning that when you log off, everything on the virtual desktop is discarded. Save to cloud or network storage. USB Devices – not supported on Android devices. To access working documents from a virtual desktop, copy them to network or cloud storage. open files and applications, switch between running applications, and minimize, maximize, restore, or close windows and applications. When you’re finished, disconnect / log off from the Virtual Desktop. Save to your H drive or other cloud or network storage. USB Devices - not supported. To access working documents from a virtual desktop, copy them to network or cloud storage. Shift Key – The Shift key in the top row of the onscreen keyboard or in the navigation keyboard is for entering key combinations, such as Ctrl+Shift. If you need to capitalize a letter or generate keyboard symbols, use the Up Arrow in the standard onscreen keyboard as you normally would. Download and install the free VMware Horizon Client for Kindle Fire from the Amazon Appstore. 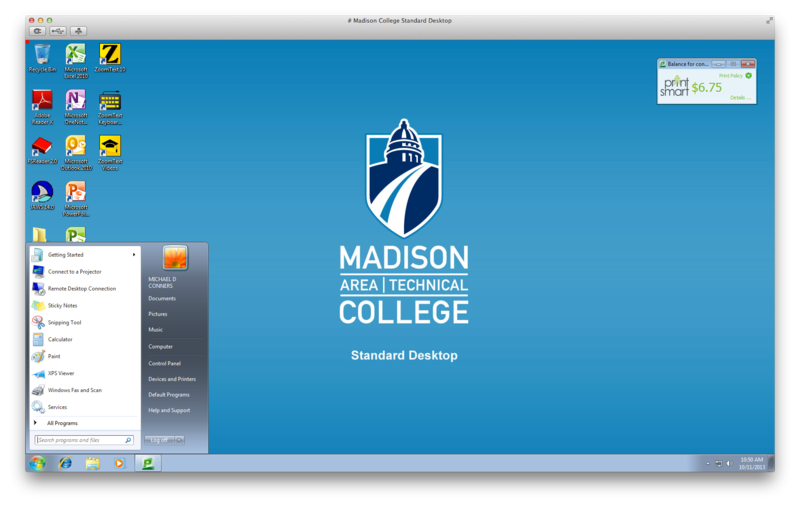 On the Server Name or Address line enter mydesktop.madisoncollege.edu and then click Connect. The toolbar is usually at the top of the screen. If you are in Full screen mode, then tap the circular icon at the right side of the screen to show the toolbar icons. 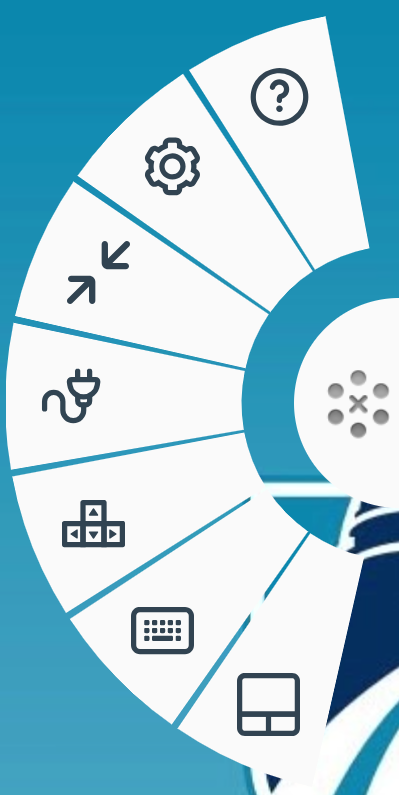 You may tap on any of the following toolbar icons for different effects. When you’re finished, log off the Virtual Desktop. Save to your H: drive or other cloud or network storage. USB devices and Printing - not supported on Kindle Fire devices. 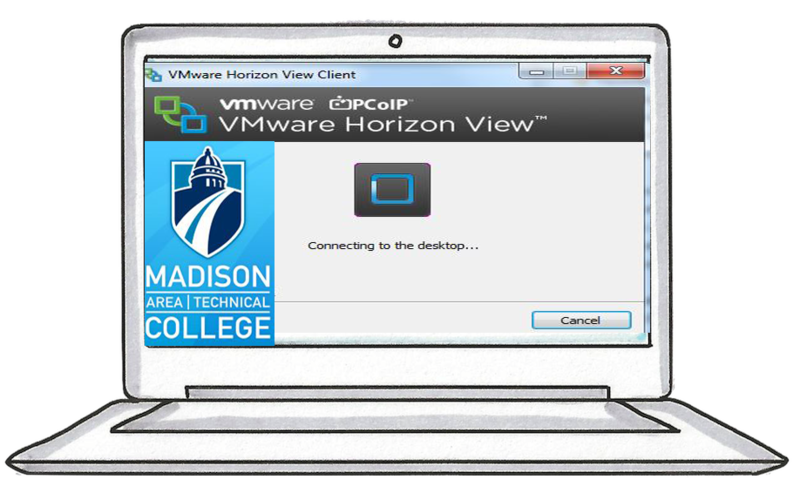 Click on Install VMware Horizon View Client. 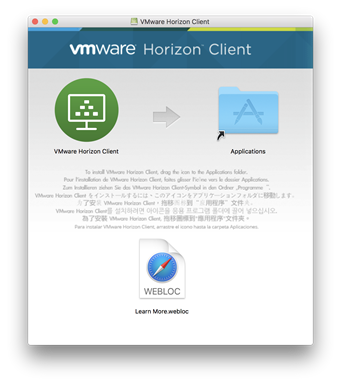 Click the link - To see the full list of VMware Horizon View Clients (including Linux clients). Download the 32-bit or 64-bit Linux client appropriate for your system. 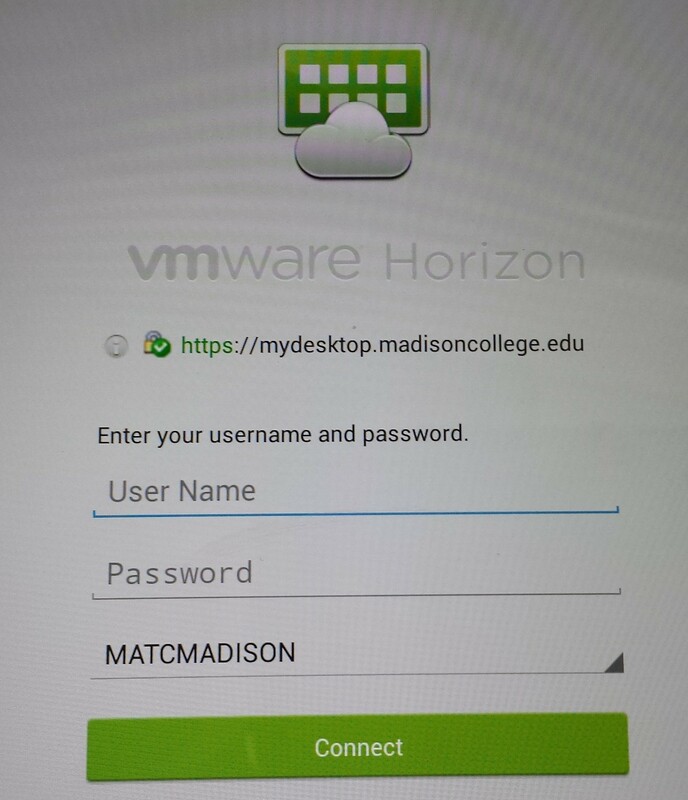 In the next window, log in with your usual College username (do not add @madisoncollege.edu) and password, then click OK.
You will be returned to your computer’s normal screen. 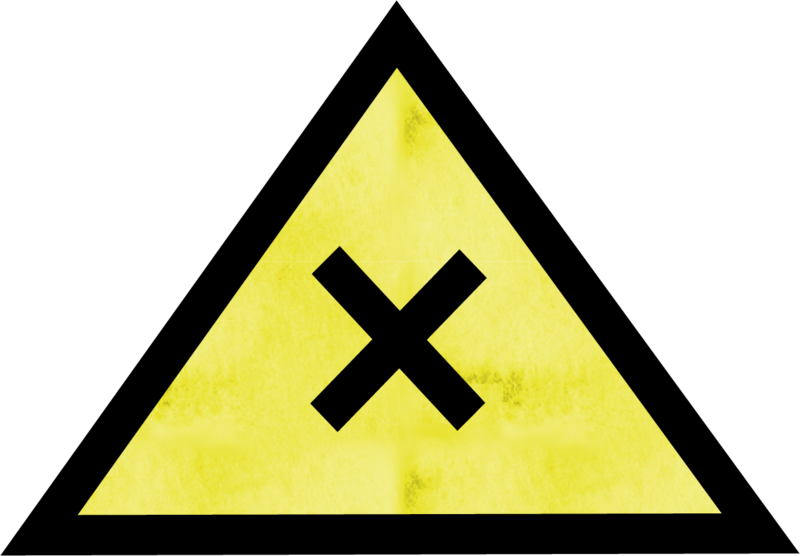 USB Devices – are not supported by the Linux Client. To access working documents from a virtual desktop, copy them to network or cloud storage. Printing – Printers connected to the Linux computer are not supported on virtual desktops. 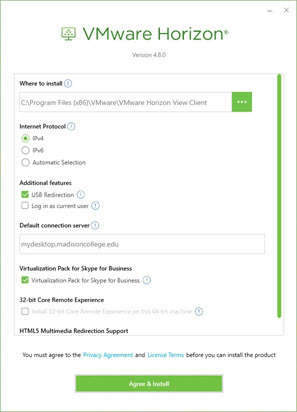 Download and install (or upgrade) the free VMware Horizon Client ffrom the Windows Mobile Store. When you can't add the Client app, for example, many Chromebooks or when using someone else's computer.